I confess that I’m a ruins junkie. I just can’t seem to get enough of exploring ancient Mayan temples and climbing Aztec pyramids. Year after year, the mystery and stark beauty of Mexico’s pre-Hispanic ruins keep me coming back for more. Over the decades, I’ve accumulated a large stash of archaeology guidebooks to feed my habit. 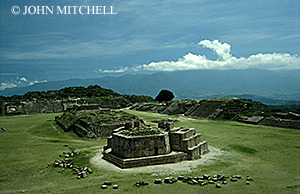 But the one I always reach for first is Archaeological Mexico: A Traveler’s Guide to Ancient Cities by Andrew Coe. The son of two well-known anthropologists, Andrew Coe grew up visiting Mexican archaeological sites, and his enthusiasm for them comes through on every page. Coe provides historical and touring information about popular sites such as Chichen Itza, Teotihuacan, and Monte Alban, along with dozens of less-visited ruins throughout Mexico. However, what is really outstanding about this book is how Coe examines the archaeological record and attempts to cut through questionable myths that have grown up around many of Mexico’s pre-Columbian civilizations. Each chapter of the book highlights a different geographical region, and Coe ranks archaeological sites by assigning them different numbers of trowels. For example, Four Trowels indicate “a world-class site, a must for every visitor,” and One Trowel denotes a site for the “indefatigable archaeological tourist.” Coe also includes useful maps and sidebars on special topics relating to Mexican archaeology. Unfortunately, the latest version (2nd edition, 2001) of this indispensable guide can now be a bit difficult to track down, and some of the practical information is out-of-date. Needless to say, I keep praying to the gods that Avalon Travel Publishing will provide me with a new fix in the form of an updated and expanded edition. Mouse over images in the slideshow below to view captions or click on them to see licensing and purchasing info. Great post, John. I’m right there with you. Remind me to tell you about my adventure into a shaft tomb in the hills around Lake Chapala sometime. Over 30 years ago,I went with a local on a couple of burros for hours in a rainstorm to reach the cave. Thanks, Dave. Perhaps sometime you can tell me the whole shaft tomb story, preferably over a cold cerveza or two.